Slab Doors (European Style) | ACS, Inc. Creating a sleek and contemporary feel, high-end slab doors have found a home in most euro-styled kitchens. The simple slab style door and drawer front combination is typically used on overlay (or frameless) cabinet construction. This type of cabinet style has been long popular in Europe and notes a certain contemporary feel, especially when using a solid high-gloss color. ACS manufactures slab fronts in both TFL and acrylic materials. View our material partners page for available panel brands. Our high gloss panels, which offer a glass like appearance, are made of non toxic acrylic. They are scratch resistant, so don't worry about high-traffic areas. Matching 1mm "zero-edge" banding on all edges makes for a seamless look. ACS also offers slab doors in a variety of textured wood-grain TFL colors. 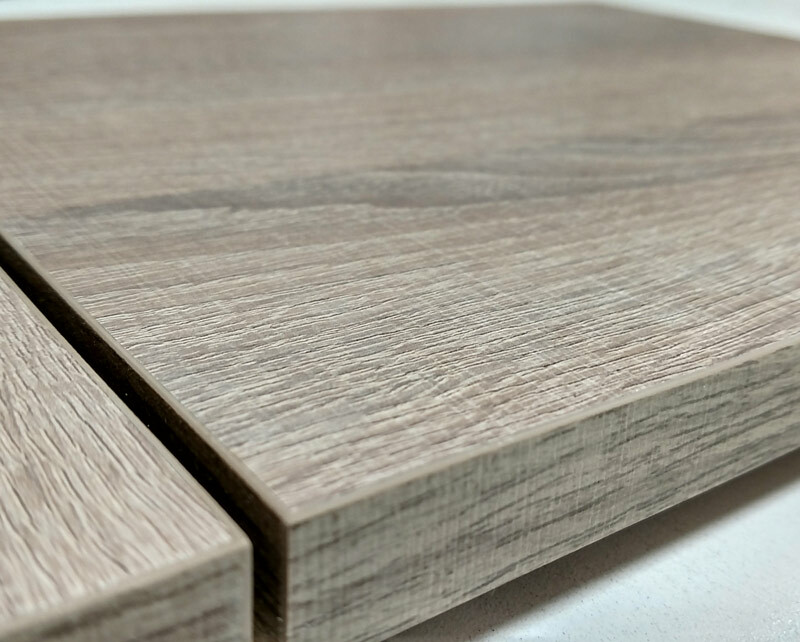 Used as accent fronts in modern kitchens or even as the primary material the real wood look of our TFL slab doors brings warmth and a natural beauty to any space.